Google AdSense Policy Change: Verify Every New Site/Blog, How and Why? Google Adsense policy change is something that every blogger and adsense earner should know about. If you are a blogger, then you already know what Adsense is? Adsense is one of the most popular contextual ad networks. Bloggers and websites are using Google Adsense ads to monetize their content. Time to time Google adsense make some changes and update its policies. Every blogger wants to make money from Adsense. It is necessary for every blogger to be aware of Google adsense policies. This will help them to stay away from the ban or invalid activity. Google Adsense has recently declared the change in their policy. This time Google adsense policy wants to you verify every new site through a verification process to display ads. That means if you are running multiple blogs and using adsense on all blogs then you must verify all the blogs using Google Adsense site verification process. This verification process is known as 2-step verification process. Google you to verify the ownership of the blog or website. You have to prove that you own the site or you can modify the content. Google Also review each of the websites to find out if it complies with the latest Google adsense policies. You will be able to see the "ready" mark only if Google Adsense will approve your website or blog to display ads. If Google adsense fins some issues with your blog or website, then it will mark the site with "need attention". Need Attention in Google Adsense means that you have the opportunity to make your website following the Adsense policies and fix the errors. How will Google Adsense policy change be helpful for marketers? This time you will find the "Sites" tab in your Adsense dashboard. This is the place where you can use ad site for verification. 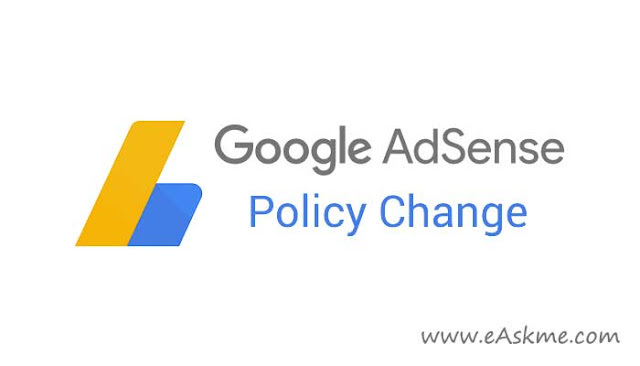 This Google Adsense policy change will help Google to improve the quality of Google Adsense program for advertisers. I hope this will also help bloggers to make more money with adsense. Why did I say I hope? Because from last some time Google Adsense has gradually decreased the CPC rate. This means that every year adsense earning is decreasing as compared to the previous year because of the drop in CPC rate.